A few weeks ago, my sister went through all the closets in the house and culled a ton of old, outdated, ill-fitting clothing and donated it to a local charity. It got me thinking about the clothes we wear for our jobs, and the expectations and perceptions attached to one’s unique sense of style. Then it occurred to me that writers don’t really have uniforms. We often work alone all day, usually in the comfort of our home office. I was surprised to find out how many writers get fully dressed to write instead of wandering to their computers in their underwear. Considering how writing has become an after-work ritual for me, I couldn’t conceive of wearing anything that might stifle my creativity. I can’t quite imagine Margaret Atwood, Nora Roberts, Georgette Heyer or Jane Austen schlupping around in their footie jammies while penning masterpieces, but neither will I believe couldn't be comfortable and look fashionable while working. Unfortunately, I can only achieve one of those at a time. In my opinion, the writer’s uniform should play two important roles: it should (a) be comfortable; and (b) indicate to the outside world that you are WORKING, and that you CAN’T BE DISTURBED RIGHT NOW. Note: I’m sure there are people out there writing in three-piece suits and high heels, so comfort is subjective. In my definition, comfortable means that state in which you can produce the highest word count possible. My writing uniform starts with stretchy cotton jogging pants and a soft sweatshirt. I have two of each in my “writing clothes” drawer. A pair of cozy fun socks is essential; I usually opt for either my knee-high rainbow socks or the puffy spa socks I got for Christmas. Sitting in front of a screen and not moving for hours means your blood stops circulating and you get pretty cold, so I will usually don an oversized zip-up hoodie. The one I own has what I call “writer’s elbow”--a giant hole in the left elbow worn in from propping your chin up while sitting in front of the monitor. Unfortunately, a sweatshirt and hoodie aren’t usually enough for me, since I am a cold-blooded lizard woman, and because I’m somewhat frugal and enviromentally conscious of energy use, I don’t usually turn up the heat. Instead, I’ve taken to wearing hats indoors. 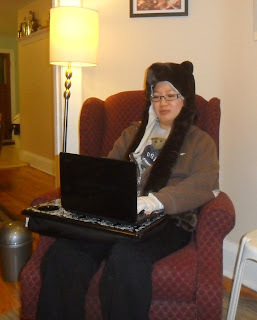 I have two hats for writing: a hand-knit beanie, and THE SERIOUS HAT. If I am wearing THE SERIOUS HAT, it is because all the blood has gone to my brain. THE SERIOUS HAT is very warm. My husband and cat both know not to talk to me when I wear it. If I am wearing it, I have likely locked my office door because I’m on deadline. One look at me in THE SERIOUS HAT, and you will understand that I AM SERIOUS about writing. Finally, to combat the dreaded “mouse hand,” I put on a pair of Dickensian writing gloves. They’re a pair of white cotton dollar-store gloves with the tips cut off. When I put them on, I like to pretend I’m Bob Cratchit, counting beans for Mr. Scrooge who won’t turn the heat up. I think you'll agree, my outfit definitely gets the job done. Do you have a uniform you wear for a specific activity other people wouldn’t wear one for? Maybe you have a vacuuming outfit? A poker night suit? A wine-drinking dress? Bacon-frying socks? My son who has numerous hats, never wears one of them outdoors. Yet he does wear them when he's on his computer doing homework. One day I finally thought to ask him the "BIG QUESTION." Why do you only wear your outdoor hat indoor? His answer to me was quite simple and it had nothing to do with warmth. He said, "it keeps my thoughts in my head on the inside and keeps the distractions at bay on the outside. It's easier to do my work. Just think how much I'd get done at school if only they let me wear my hats." Now I sit looking at the photo of you Vicki and think..... is this the "SECRET" to success! Mary--I know what your son means. I had a hat I used to wear to calm myself down during the insanity leading up to my wedding. When I was wearing my special hat, the world was far away and I was serene. Vicki--I bet Margaret Atwood has a pretty interesting writing outfit and I'd further bet it's a uniform of some kind. I'd love to know. As a fellow frugal, environmentally-minded person who writes most often late at night, I almost always write in outdoor clothing. Hats and long underwear. Extra socks. In fact, I could transition from writer to winter-weather camper with very little effort. Not that I would want to because cold-weather camping is one rung below warm-weather camping and just above poking myself with needles on my list of things I enjoy...but I could. I'm a jeans girl. I only wear stretchy pants when I work out, which is not nearly often enough. I do always do my hair and makeup for my monthly chapter meetings. It makes me feel like I'm going to a real job. I still wear jeans, but pair them with a nice top or sweater, and I sometimes even remember jewelry. When it's cold, I have a big pink fluffy robe I wear over my jeans. But this year I finally got a Snuggie. I moved my writing chair to make room for the Christmas tree, and it's still there, in front of the fire. I think I'll keep it here. Maybe I should try a hat when I want to get into the zone. Simply putting in my sparkly pink earbuds doesn't seem to be enough of a signal to my family to leave me alone. Hi Vicki--I love writer's elbow! I never knew the clothing malady had a name. I can't be too scruffy when I write, or I don't take myself seriously, but I must be comfortable. I wear knit pants and a comfy shirt in a color I like or a hoodie. I have to have a positive connection to the clothes I wear when I write and color is really important to me. I love your hat picture, by the way. It makes my head hot looking at it. I've knit myself wrist warmers for writing. I love them. My kids love them, too. I ended up making three pairs for my daughter and one for my son--although he calls them hobo gloves. A man thing, no doubt. Anyway, I highly recommend them. What a great picture Vicki :) I don't write, but I do wear very comfortable clothes to work. 99% of the time it's shorts, t-shirt and rubber slippers. If I have a meeting, I wear good jeans and a t-shirt (or dress shirt if it's really important). If I go out in the field, I wear what is appropriate to the job, shorts, jeans, swim suit and company work t-shirt and shoes! I am all for comfortable while writing. I wear loose-fitting yoga pants and a stretchy top. Definitely need socks to keep the tootsies warm. I even have a writing bra. My husband hates it. It doesn't keep the girls perky but it's soft and comfortable. I come home from the day job and put on my pjs, slippers and a sweater to write. Probably the reason my scrubs are so tight, I've been wearing another uniform, to work lately--my fat clothes. Anything black that still fits since I refuse to give in and buy a bigger size. And I will be trying the hat. I'm sure my husband will appreciate it since my office is the only room I insist on keeping above 68 degrees. Even when I'm bundled I'm cold. I have a 'day at home house cleaning outfit'. It's the same set of clothes every time. I am so set in my pattern the neighbours know it's my cleaning day, just by the clothes. They are comfortable & I don't care if they get stained. Mary R: I'm with your son on this one. If it makes him productive, then why not wear a hat? Snookie: Can I have your job? I don't care what it is, but if you're wearing shorts every day, Lizard Woman me would enjoy being somewhere hot. Question of the Month: Trapped in a Movie?